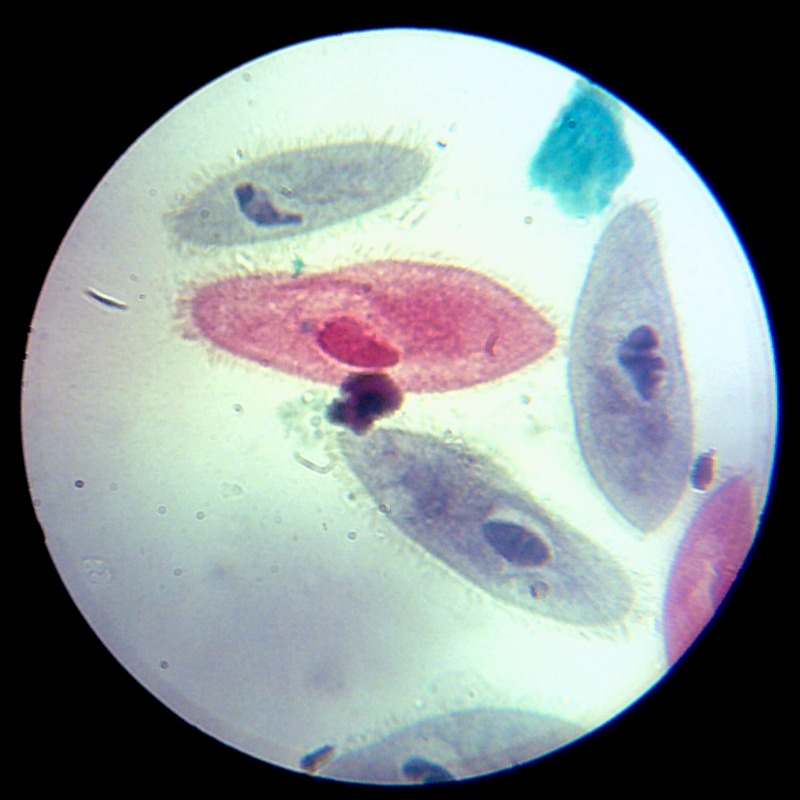 Paramecium are single-celled organisms that belong to the Ciliophora phylum. Members of this group are characterized by having cilia, or little hair-like structures covering their surface. Once called “slipper animalcules” due to their oblong shape, Paramecium live in a variety of watery environments, both fresh and salt, although they are most abundant in stagnant bodies of water. They eat other microorganisms like bacteria or algae by sweeping them towards their cell mouths (cytostomes) where they’re absorbed and digested. These cilia, however, are useful for more than just eating. Cilia are able to move in a coordinated way to propel a Paramecium forward. When an obstacle is encountered, the cilia move in the opposite direction, backing the Paramecium up a bit, before continuing forward, rather like a Roomba trying to vacuum your living room floor. Paramecium spend more than half of their energy just on moving, as their short cilia make their movement method less than 1% effective. 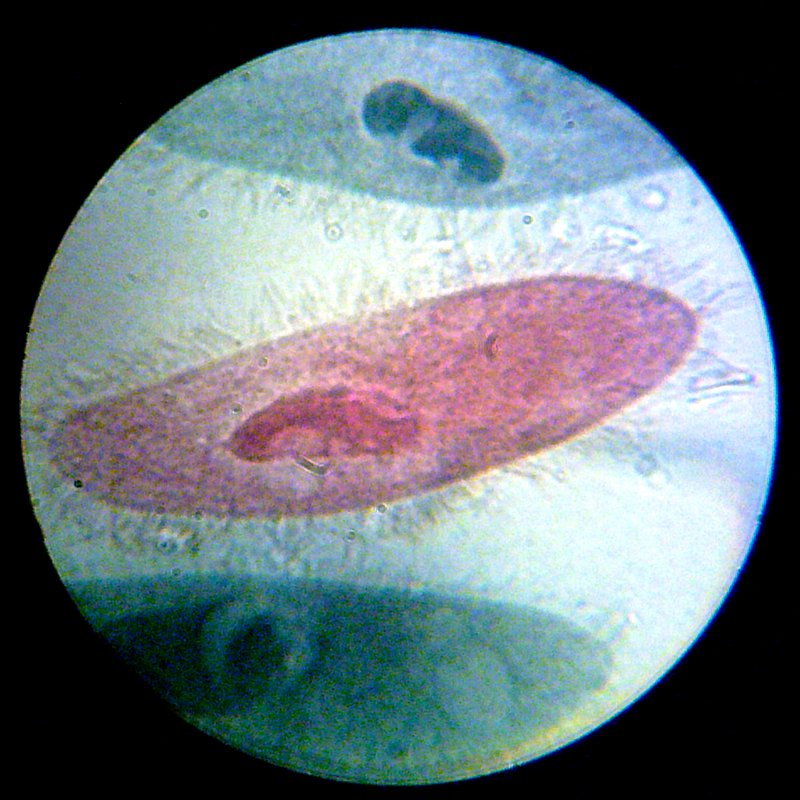 If you took science classes in high school or university, you may have encountered Paramecium yourself. Since they reproduce very rapidly and display their organelles through their translucent cytoplasm and membrane, they’re often used in classrooms as model organisms.